Yes, a glove. Or, rather, a pair of gloves. These handsome lady gauntlets were brought to our attention by Suzanne Gerber via doppelgänger. Each is inscribed with a map to the Great Exhibition of 1851, and features landmarks such as the British Museum, St Paul's and the Crystal Palace itself. 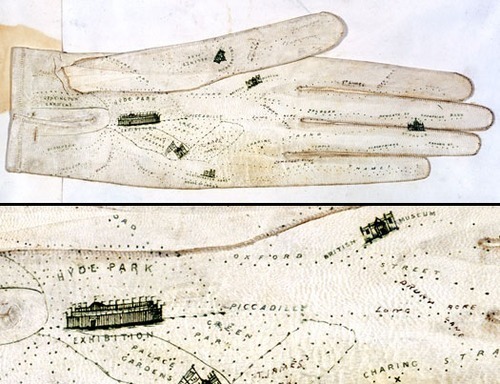 The gloves were created by one George Shove, whose handiwork is discussed further here. We love the idea of geeky Victorian ladies exploring alternative spacetime topologies by clenching a fist.